African Millennials who were born from the early 1980s until around the turn of the new millennium are perceived as having changed the world’s understanding of Africa, bringing it from a ‘dark continent’ to ‘Africa rising’ through blogging and social media (#SomeoneTellCNN). They are often thought of as mobile, connected, and tech-savvy, founders of tech startups that begin with the abbreviation, ‘M’ – for mobile, artists who don’t care much about their oppressive governments, but will tweet about it – #ZumaMustFall. Is this an accurate description of African millennials? Since the definition of the Millennial generational cohort by market researchers, those who fall into this age group have been described as entitled, lazy narcissists who still live with their parents. Perhaps the biggest trigger for a global conversation was the feature article of the May 2013 Time magazine by Joel Stein. It is particularly from this article that numerous sweeping assumption about millennials become the gospel truth. Many of us marketers have been caught up in the over-simplified characteristics that define millennials. Business decisions and marketing campaigns have spent millions of dollars based on these myths and wrong assumptions of this target demographic. However, when we examine assumptions about Millennials further, you will find that most of the commonly referred to characteristics that have been used to define millennials have been used to describe nearly every other previous generation. A New York cover article from 1979, at the height of the baby boomers generation, wrote of ‘The Me Decade’- Exports on America’s New Great Awakening. 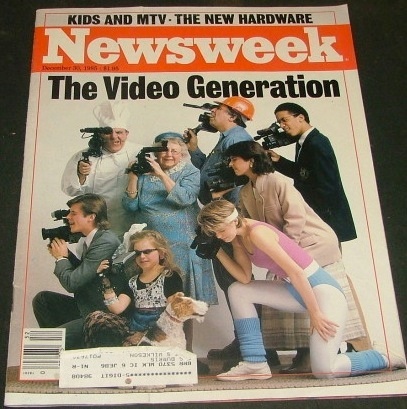 A Newsweek cover from 1985, at the height of generation X, focused on “The Video Generation” who they described as being caught up in documenting each and every aspect of their lives using the video camera. Fast forward to the year 2007, during the height of the Millennial generation, and again, the cover story in one of the Time magazine editions profiled “China’s Twentysomethings,” who were too busy living the good life to care about politics. Based on similar perceptions of older generations in the past, have we managed to get it wrong about the Millennial generation? What are the myths and what is the reality around African millennials, who we often believe are fully mobile, connected and tech savvy? Mobile research and engagement platform GeoPoll has been looking into this question to provide clarity on the true habits and preferences of this much sought-after generation. Globally, Millennials were born as the world entered a digital age; a generation that grew up with the internet and digital communications. This and their relative comfort with technology is the defining factor that sets millennials apart from previous generations. In Africa however, as various research studies confirm, Millennials have not been fully defined by the traits that have been seen in the developed world. Mobile phones are ubiquitous in Africa. The leapfrog effect for many Africans, whose first interaction with technology is with mobile phones has had a tremendous effect, making Africa a mobile-first continent. However, amidst all the hype peppered with phrases such as ‘Silicon Savannah’, ‘mobile money’ and ‘Africa Rising’, there is a reality. The reality is that, on this tech revolution that is currently ongoing, the youth are the Mavericks as confirmed by various studies by GeoPoll in multiple African countries as well as by other research agencies. Africa is by far the youngest continent in the world. Unlike everything we have heard before, millennials in Africa are not the youngest and neither are they the majority. The oldest millennial is around 38 years of age with the youngest being about 23 years old. Out of a population of 1.2Billion in the continent, those aged 19 years and below are at 51%. Millennials make up less than 30% of the continent’s population. A new generation which is the majority in Africa is here; Generation Z or the iGen cohort, of those between 15-20 years, are the young and they are the majority. Although Africa has the highest growth rate in mobile phone penetration, there are only 420M unique mobile subscribers and a penetration rate of 43% in Africa against the global rate of 63%. Internet penetration remains significantly lower. There are only 300 million internet users, a majority of whom access the internet via their mobile phones. Currently, 75% of people in Africa are still offline. This is attributed to lack of basic infrastructures such as grid electricity; high data costs, and household income levels among other factors. Despite this, internet access, especially that via mobile phone subscription, is growing and predicted to reach 41 percent of Africa’s population by 2020. One of the biggest defining characteristics of Millennials globally is their usage and dependence on mobile phones. Increased dependency on technology and a mobile first approach is being driven by African Millennials according to a recent GeoPoll rapid survey carried out among youth in five Sub-Sahara African countries between the ages of 18-35. 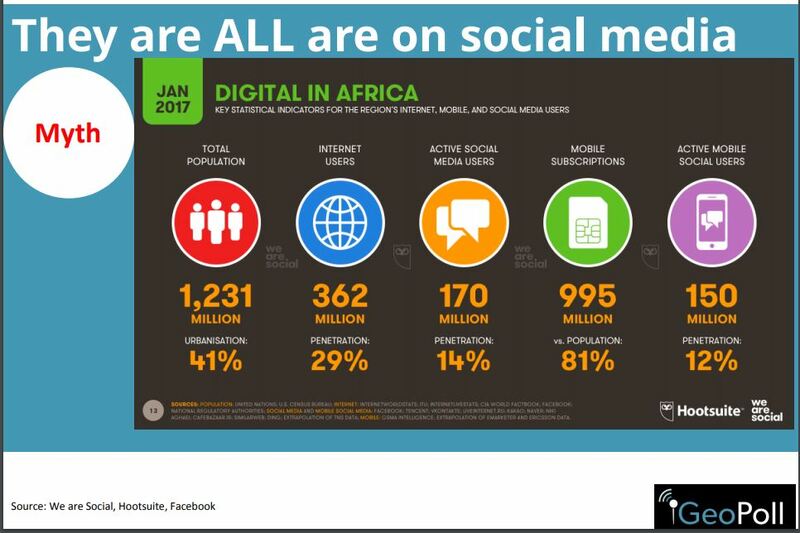 Although social media has become the first point of breaking news in many regions, as seen in the percentage of those online and those on social media, in Africa, radio and TV are still king. Sub-Saharan African consumers watch TV or listen to the radio twice per day on average, while they access the internet only every second day. However, African millennials have a different view on ownership in media and this is driving the diminished importance of live TV as the dominant communications channel. This is a generation that has become a ‘prosumer’- creating and consuming their own content on blogs, YouTube, and various other social channels. The assumption that millennials do not care about matters to do with political participation, civic engagement or public affairs has been attributed to their ‘short attention span’. This is a myth as has been demonstrated by various research studies carried out on this demographic. A study in 2014/2015 by the Africa Barometer among a survey sample of respondents aged between 17-35 in 7 African countries shows strong evidence of interest in civic engagement, public affairs and politics among African youth. A more recent straw poll by GeoPoll in 2017 among a similar demographic in 5 African countries assessing their interest in public affairs shows concerns in levels of corruption, youth unemployment and distribution of national resources. Social media has become an important tool through which the connected Millennials voice their concerns and engage on the things that matter to them. This can be seen in movements and campaigns such as #BringBackOurGirls, #FeesMustFall, and #DataMustFall among others. Although African millennials are not young nor are they the majority in Africa, they have now entered the workforce in strong numbers. According to CA Global, today, those born between 1980 and 2000 are now of working age, and they are changing the operation of the workplace as they go. As a socio-economic group, Millennials are growing in power and investment potential. In addition to reshaping the workplace, they are also influencing marketing and advertising strategies across the African continent. Learning how to work with Millennials has become increasingly important over the past few years, as studies have noted. This requires a shift in communication messaging, integrated communication through online and offline channels as well as have an understanding that the decision-making unit for Millennials has evolved. Generation Z, currently aged 22 years and below, are now the majority in terms of population in Africa. This is the first generation born into a fully technological environment. Although they seem similar to Millennials, especially in the use and uptake of technology, the iGens have some unique traits that must be examined more closely. As this next generation acquires more spending power and marketers begin to turn towards them, our focus should move to better understand this younger demographic in addition to the much-discussed African Millennials.